The Alaska Anchorage Seawolves will travel to Denver, Colorado to face the No. 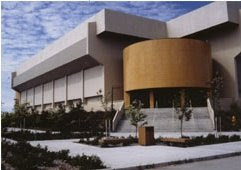 7 Denver Pioneers in Western Collegiate Hockey Association series on Jan. 30-31 at Magness Arena. Game time is scheduled for 7:37 p.m. (MST) on Friday night and at 7:07 p.m. (MST) on Saturday. Both games will be televised live on FSN Rocky Mountain and webcast live on www.DenverPioneers.com. Radio broadcasts include 560 AM (Friday) and 101.5 FM (Saturday) in Denver. The Pioneers lead the all time series 36-13-5 dating back to 1992-93, and DU leads those games played in Denver 19-6-1 and 11-3 in Magness Arena, with DU going 8-0 in its last eight games against UAA and 9-1 in the last 10. Last season the Pioneers swept UAA in both conference series. DU has held UAA to three goals or less in the last 11 contests. 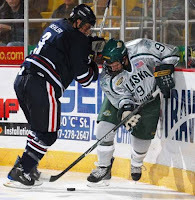 Since joining the WCHA, UAA has only swept two series against DU - both at Sullivan Arena in Anchorage (1996 and 1998). Alaska Anchorage is ninth in the WCHA with 14 points. The Seawolves are led by forwards Paul Crowder and Tommy Grant. Crowder leads the team with 9-14--23, while Grant has added 14-7--21. Kevin Clark (6-12--18), Brian Bales (1-14--15) and Josh Lunden (10-4--14) are effective scoring forwards as well. Bryce Christianson (3-4-3, 2.85 GAA, .875 Saves percentage) and Jon Althuis (5-6-1, 3.32 GAA, .866 saves percentage) have shared goaltending duties. I haven’t seen UAA play this year, as Seawolves and the Pioneers (15-7-3, 11-5-2 WCHA) will meet for the first time of the season this weekend. With Denver currently leading the WCHA with 24 points, ranked (7th/8th) nationally and playing at home and the Seawolves ninth in the WCHA and unranked, the conventional wisdom would say that the Pioneers should be the better of the two teams this weekend. However, the Pioneers are coming off a huge emotional letdown in Grand Forks, where they played well enough to split but came away with only a point and an embarrassing impression left by the ejection of DU coach George Gwozdecky. Gwozdecky will be under a school-imposed one game suspension for this Friday’s UAA Game after using a headset to communicate with his coaching staff after being ejected from the Staurday UND contest in the second period. “I want to apologize to the University of Denver and our hockey team for not having a thorough understanding of the NCAA game misconduct rule,” Gwozdecky said in a DU statement. “I respect the University’s decision to suspend me based upon the violation that occurred.” How they react to Gwozdecky's absence remains to be seen. According to veteran UAA observer Donald Dunlop at his ‘UAA Fan Blog’, “DU fans will see a quite different UAA team than they've seen in the past. This year’s team has two primary identities. They are big. They can skate. The forward lines heights and weights read like an NHL roster ... 6'4" 210 -- 6'3" 200 -- 6'3" 203 -- 6'2" 190 -- 6'2" 198 -- 6'2" 202 -- and three other 6 footers….For the last two years under Coach Shyiak the cycle game has been the strategy of choice. If Donald’s observations are correct, DU will likely try to counter UAA by using their team speed to offset UAA’s size advantage. DU likely also has more top end speed and talent than UAA does, so expect Denver to try and stretch the UAA defense in transition, much the way North Dakota did to Denver last Friday. UAA has historically frustrated the Pioneers with strong team defense and a relentless work ethic, and they’ll try to grind the Pioneers with their size. I expect DU will try to balance puck control with the need to shoot more often when they gain the offensive zone to take advantage of the saves percentages of the UAA goalies. On paper, DU is eighth nationally in team offense, while UAA is 32nd. Defensively, DU is 15th, while UAA ranks 46th. DU’s power-play is 36th nationally, while UAA’s is 46th. On the penalty kill, DU ranks 15th while UAA is second-to-last nationally at 57th. Prediction: DU 4, UAA 2 on Friday, Denver 2, UAA 1 on Saturday. I think given AA's dismil kill ranking and the fact the boys will be fired up and ready to go the score Friday will be one-sided.4 or 5-1 DU. I think they'll use their speed and split the D much like they did against Colgate. I think the PP will produce this weekend as it looked pretty good last weekend against the girls from Grand Forks. I too am looking for a DU blowout on Friday and a tight game on Saturday. I think if DU loses it will be on Saturday. Bingo! We're batting a thousand DG! Real nice puck movement tonight. Glad to hear you're coming up for the Tiger roast! I want to see another spanking tomorrow. I think the boys will be mentally ready. I sense that they are getting their stretch run face on!